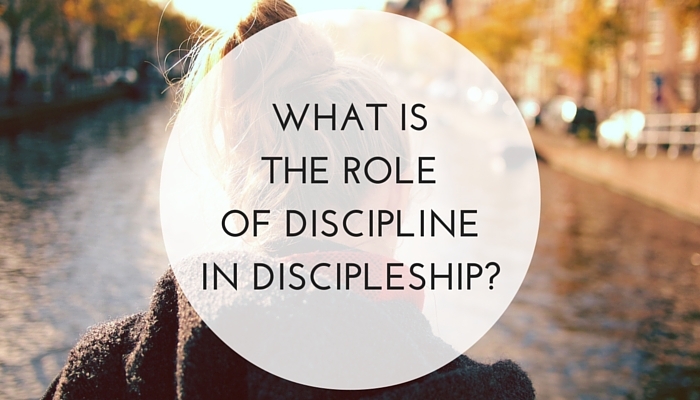 What is the Role of Discipline in Discipleship? Cereal and steak. Chocolate cake and broccoli. Oil and water. That’s probably about how well most people view discipleship and church discipline going together. The words “discipleship” and “discipline” sound similar, but for many in the church that’s where the similarities end. Many see church “discipline” as harsh or mean-spirited. They see it as the church beating people up…in Jesus’ name! (And while that isn’t at all what church discipline is about, certainly some churches have distorted the practice along these lines). Many would say, “What does THAT (church discipline) have to do with lovingly discipling people to grow in their faith?” The two just don’t belong in the same conversation. But I would contend that it’s quite the opposite--you actually can’t have a conversation about one without the other. And the reasons are really quite simple. Discipleship is about growing to be more like Jesus. It’s about answering the call Jesus gave to four fishermen beside a lake 2000 years ago, “Follow me, I will make you fishers of men” (Matt 4:19). As we respond to the Good News with faith and repentance, we begin a lifelong journey of becoming more and more like Jesus (2 Cor 3:18; Rom 8:29-30). As we grow in discipleship we learn to speak like Him, think like Him, and prioritize our lives like Him. We learn to love the things He loves and hate the things He hates. To the degree that such growth is happening, discipleship is happening. We’re learning to be disciples of Jesus. We’re learning to be Christians (“little Christs”). But sometimes we get stuck. Sometimes we go in reverse. Sometimes we leave the path and “turn aside to the right hand or to the left.” We all do, because we have not yet “arrived” to the place where we’re just like Jesus. Sanctification is a process, and while for the true child of God the trending direction will be upward (Phil 1:6), there will be ups and downs along the journey. David had his Bathsheba. Abraham had his “sister” lying streak. Peter had his rooster. And you and I have our weaknesses, our blindspots, our remaining ‘pockets of sin’ where God is still at work. But when we fall, when we start to go in reverse, when we start to live less like Jesus instead of more like Jesus, then our discipleship is stuck. So how do we get “unstuck”? How does the train of our discipleship start to move down the tracks again? Certainly the conviction of sin by the Holy Spirit, the daily practice of repentance, and the grace of God that lifts us up and puts us back on our feet are paramount. But rarely is this process a completely individual thing. God also uses the built-in accountability of being a part of a biblical community to get us “unstuck” as well. One of the evidences of God’s grace in our lives is the church, the people of God, that we were saved into when we first believed (I Cor 12:13). We weren’t meant to live out the Christian life on our own. We were meant to live it out in community with other disciples of Jesus who are also growing to be more like Him. It’s in the church that we carry out all the “one another” commands. In the church we’re told to love one another (Jn 13:34), accept one another (Rom 15:7), serve one another (Gal 5:13), forgive one another (Eph 4:32), encourage one another (I Thess 5:11), and spur one another on (Heb 10:24). But in the church we’re also called to admonish one another (Rom 15:14), to exhort one another (Heb 3:13), and to confess our sins to each other (Jas 5:16). Paul instructed Titus concerning those under his charge, “rebuke them sharply, that they may be sound in the faith” (Titus 1:13). If our understanding of “love one another” cannot be harmonized with the words “rebuke them sharply,” then we don’t have God’s definition of love. But doesn’t it hurt discipleship? But in reply, it’s not “mean” to love people like Jesus said. God gets to decide what love looks like in His church. And He has told us clearly and repeatedly that if we truly “love one another” in the church we’ll “speak the truth in love” with each other about our sin. We won’t be a church that runs from hard conversations or tries to sweep everything under the rug. In the end a church that runs from discipline is a church that doesn’t understand discipleship. Thankfully we’re not left to our own devices to figure out how discipline should be carried out in the local church. In Matthew 18:15-20, our Lord gives us the steps. Step 1 is private one-on-one correction. Step 2 is small group intervention. Step 3 is church admonition. Step 4 is church exclusion. But nobody gets there (to step 4) unless they demonstrate repeated unrepentance and hardness of heart, to the degree that the church can no longer vouch for their salvation. If church discipline is done correctly, every step is motivated by love and by a desire to see the individual restored to the Lord and to the church. This is true even with the painful step of having to exclude an individual from church membership. It’s not the church “beating people up” or saying “gotcha!” It’s a biblical, Jesus-commanded, love-motivated, radical measure to help get a disciple back on track…or to help them see that they never were a disciple to begin with. But step 4 cases are the rare cases. Step 1 is where we live. This isn’t based on scientific polling data or anything but I would estimate that 98% of discipline done in the church happens at step 1. In fact, you could say that step 1 discipline, one believer admonishing or correcting another in a particular area of that believer’s life that doesn’t look like Jesus, is essentially what discipleship is! When you come alongside another believer and invest in their life, you’re not discipling in a vacuum. You’re discipling a real person, with real pockets of sin remaining in their life. You’re not addressing “generic” issues—you’re addressing their issues, even as you continue to seek God’s grace to overcome your issues (because again, none of us are there yet!). And when you address those areas from the Word, and teach and model what Christlikeness in those areas looks like, you’re living in step 1…one-on-one correction. There is no real discipleship without loving each other enough to do this. So far from discipleship and discipline being oil and water…they’re more like peanut butter and jelly, waffles and syrup, or Thanksgiving and turkey. If we’re going to be committed to helping each other grow in discipleship to be more like Jesus, then we’re going to be committed to discipline in those areas where we don’t look like Jesus right now. By God’s design, you simply cannot have the one without the other in the church of Jesus Christ. What is the Role of the Church in Discipleship?